This thematic volume of Advances in Chemical Engineering presents the latest advances in the exciting interdisciplinary field of nanostructured materials. 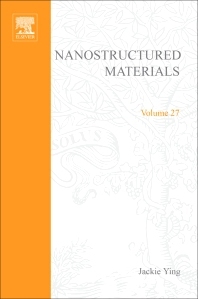 Written by chemical engineers, chemists, physicists, materials scientists, and bioengineers, this volume focuses on the molecular engineering of materials at the nanometer scale for unique size-dependent properties. It describes a "bottom-up" approach to designing nanostructured systems for a variety of chemical, physical, and biological applications. Academic and industrial researchers in chemical engineering. University of Delaware, Newark, U.S.A.
Gregory Stephanopoulos is a Professor of Chemical Engineering at MIT. He received his B.S. from the National Technical University of Athens, his M.S. from the University of Florida and his Ph.D. from the University of Minnesota, all in Chemical Engineering. Upon graduation, he joined the Chemical Engineering Faculty of the California Institute of Technology, where he served as Assistant and Associate Professor until 1985. In 1985 he was appointed Professor of Chemical Engineering at MIT where he has been ever since.Stephanopoulos' work has appeared in more than 150 publications and 7 patents. He has been recognized with the Dreyfus Foundation Teacher Scholar Award (1982), Excellence in Teaching Award (1984), and Technical Achievement Award of the AIChE (1984). He has been a Presidential Young Investigator and the Chairman of the Food Pharmaceutical & Bioengineering Division of the American Institute of Chemical Engineers (1992). In 1992 he was a Visiting Professor at the International Research Center for Biotechnology at Osaka University and was elected a Founding Fellow of the American Institute for Medical and Biological Engineering. In 1996 he chaired the first Conference on Metabolic Engineering and gave the inaugural Bayer Lecture on Biochemical Engineering at the University of California at Berkeley. He was honored with the FPBE Division Award at AIChE in 1997. University of California, Berkeley, California, U.S.A.